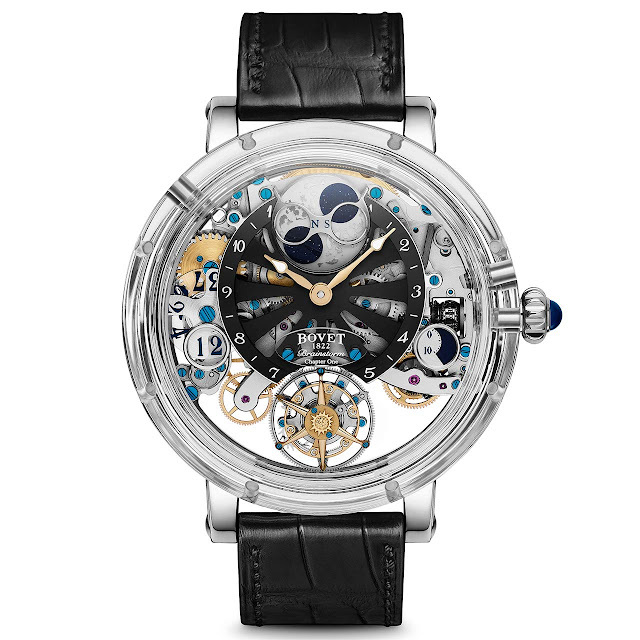 Winner of the “Aiguille d’Or” Grand Prix 2018, the highest distinction honouring the finest timepiece of the year, with its Grand Récital model, Bovet is a specialist in the creation of timepieces dedicated to astronomy. The latest creation in this tradition opens a new chapter presenting a host of innovations, hence the name Récital 26 Brainstorm Chapter One. 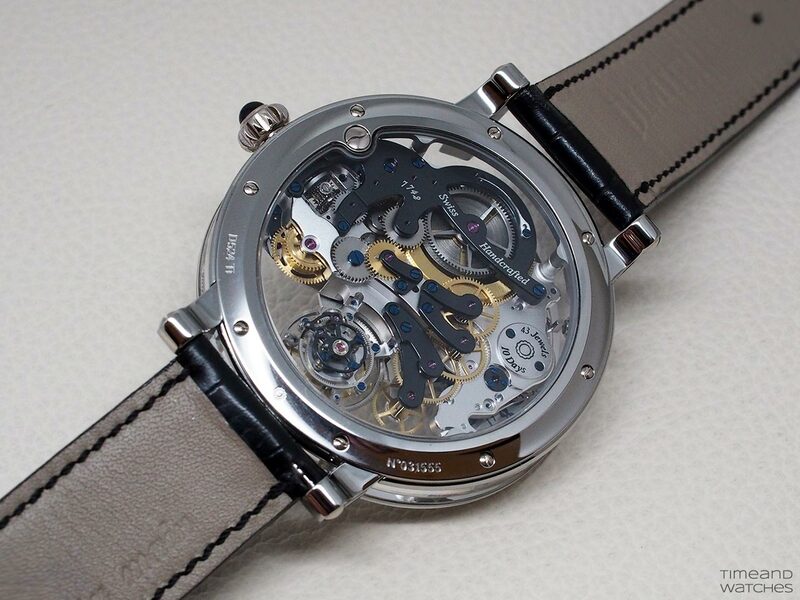 The new watch comes in a characteristic inclined case, inspired by and shaped like a sloped writing desk. This shape makes it possible to be more creative in the organization of the displays by using domes, rollers, discs, and three-dimensional hands while improving readability. The shape is not the only peculiarity of the 48 mm x 15.50 mm case. In fact, Pascal Raffy, the owner of Bovet, wanted a sapphire case for the first piece of the Brainstorm chapter. Chosen for its crystalline transparency, sapphire is also the third hardest material known after diamond and moissanite. 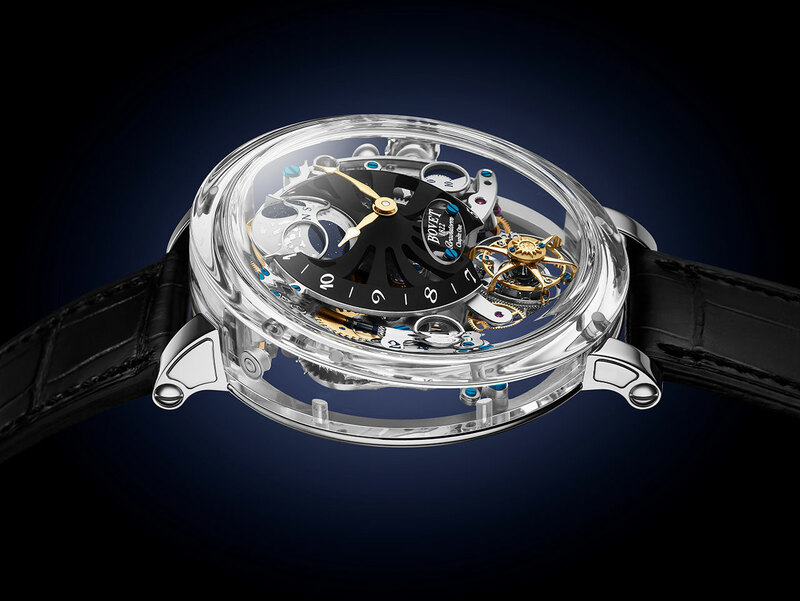 Moreover, the lightness of sapphire is excellent, weighing even less than titanium. 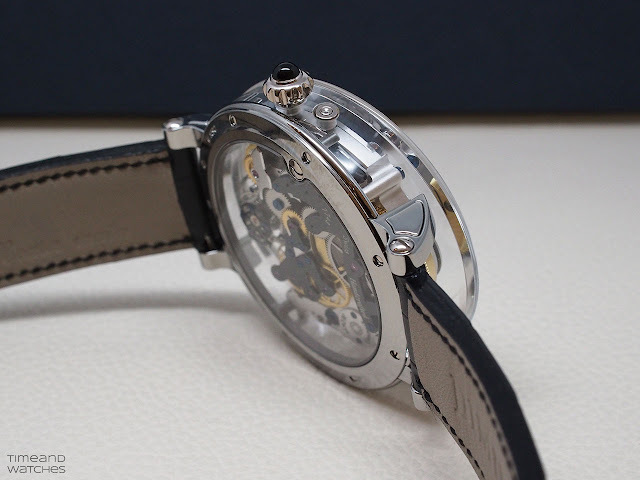 The middle and the glass form a single element while the back consists of a bezel and four horns that have been machine-cut from grade 5 titanium. This bezel features a sapphire glass to which the movement is fastened. 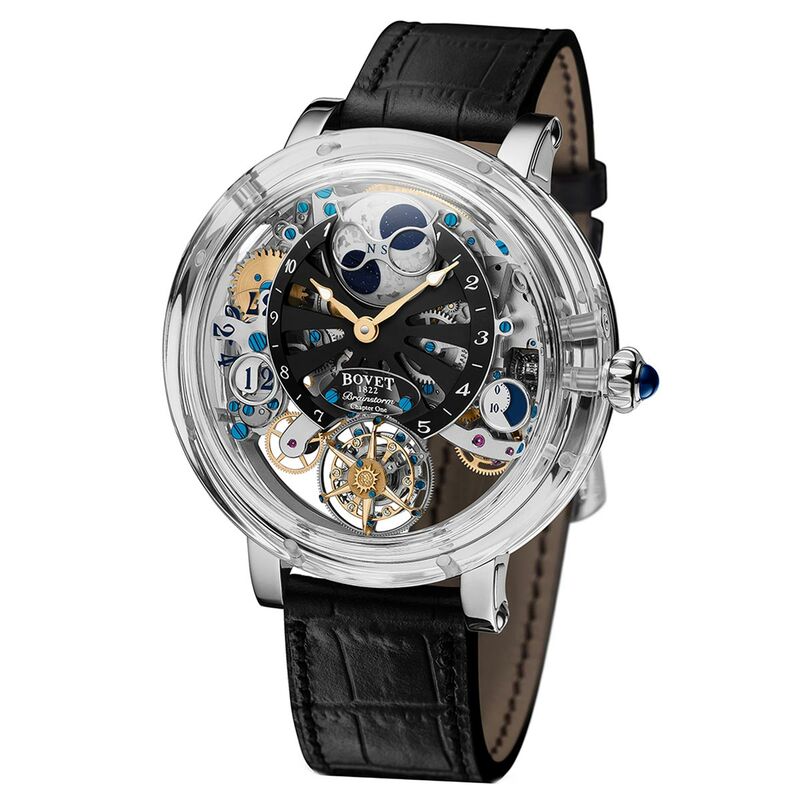 Beating at 18,000 vibrations per hour, the movement is regulated by a patented double face flying tourbillon featuring a variable inertia balance for improved chronometry through the use of a traditional hairspring. At Bovet, even the hairspring is in-house produced. A single barrel guarantees 10 days of power reserve despite several complications. A patented spherical differential winding system halves the number of turns of the crown required to wind the timepiece completely. At 12 o'clock, nestled in the volume of the hours and minutes sub-dial, arises a three-dimensional moon phase, whose dome’s camber counters the curves of the dial. To enhance realism, the lunar dome’s surface is engraved, and the lower sections filled with Super-LumiNova. To emphasize the transparency of the case, the power reserve is displayed via a printed cam that shows the energy available through a “crescent-shaped” indicator placed at 4 o’clock. Symmetrically positioned at 8 o'clock, a big date appears in a circular aperture. The entire mechanism is visible through the sapphire case. The dial can be customized at order time by choosing colours and a specific helix shape for the hours and minutes sub-dial. 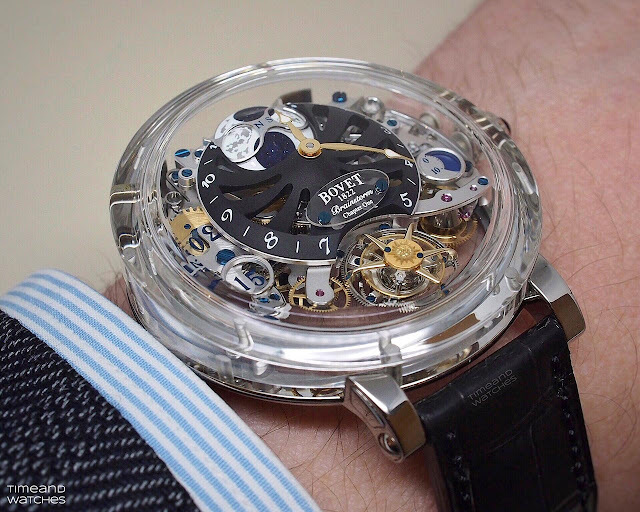 Bovet Recital 26 Brainstorm Chapter One. 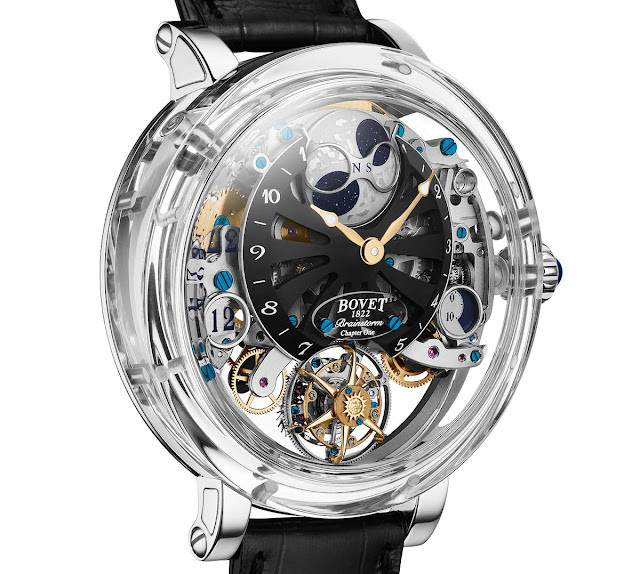 Bovet is a specialist in the creation of timepieces dedicated to astronomy. 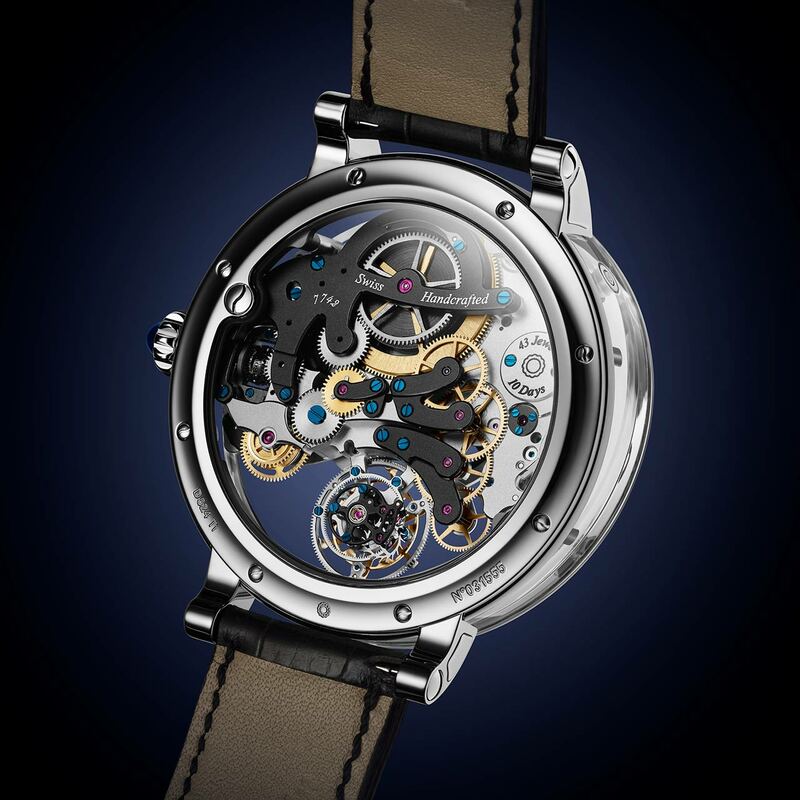 The latest creation continuing in this tradition opens a new chapter presenting a host of innovations, hence the name Récital 26 Brainstorm Chapter One. The Bovet Récital 26 Brainstorm Chapter One has a price of Swiss Francs 295,000 before local taxes. 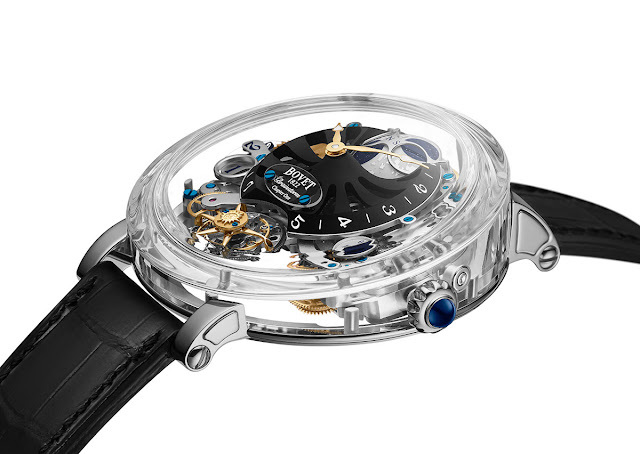 Beating at 18,000 vibrations per hour, the movement is regulated by a patented double face flying tourbillon.